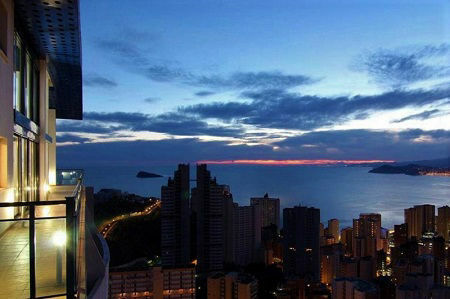 BENIDORM TOP SELLING HOLIDAY APARTMENTS: Search up to 600 holiday lets! 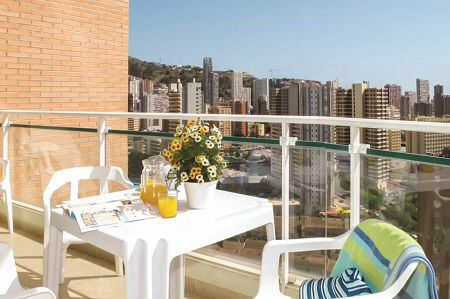 A selection of handpicked self catering holiday apartments and aparthotels in the Levante, Poniente and Benidorm Old Town. 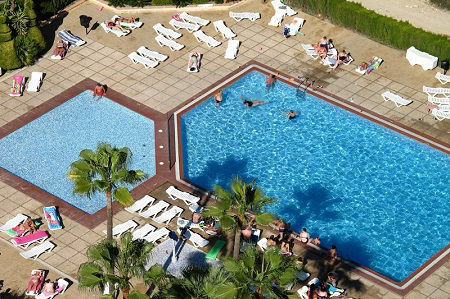 Choose from cheap budget studios to family one and two bedroom apartments for low-cost Costa Blanca holidays, and cheap self catering holidays in Benidorm Spain. Apartments are the most affordable option for friends to enjoy a holiday on a budget. You get clean simple accommodation close to lots of café bars and restaurants for cheap eats. NOTE: Apartments usaully require a cash deposit on arrival, normally about 50€ per person or 150€ per apartment. Overlooking the beach and harbour. Studio and one bedroom apartments right on the beach front and just 4 minutes walk from the old town bars and restaurants. 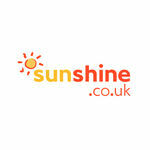 Ideal for a relaxed self catering beach holiday. Superb location in the old town. Renovated to a high standard in 2014. A skip and a jump to the sand and sea. Book soon just 33 apartments and studios. Best selling apartments for couples beach holiday. Great views, plus enjoy the use of a 4* hotel. 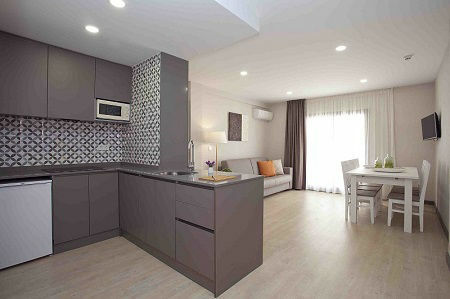 A range of one and two bedroom modern 2 star apartments in the Playa Levante. All new in 2009. Great views here! Brand new in 2018 quality studio apartments in the old town and only 150m from the Levante beach front. 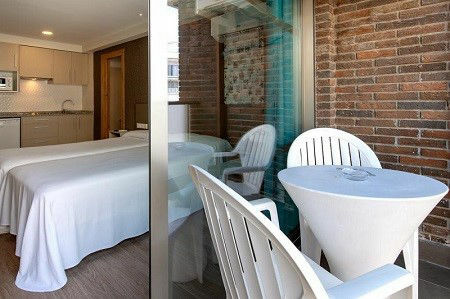 Great value stylish studios good for single holidays. Sleep up to 3. 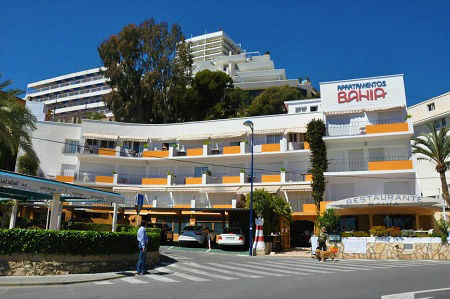 Perfect location and very affordable choice for cheap stays in Benidorm. 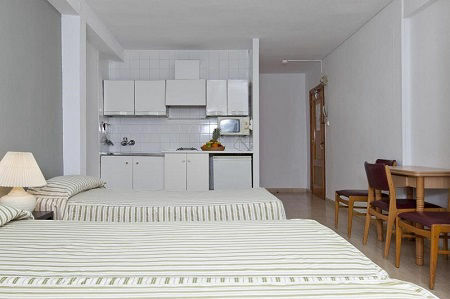 A range low cost of self-catering studios all in bloque 2. 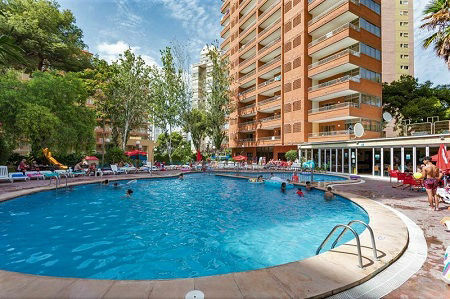 These are no frills apartments great for a lively weekend in Benidorm with a few mates. Beach 150m - bars 0m. Popular affordable choice, 500m from the beach. Straightforward no fuss simple apartments. 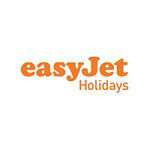 Good for a lively, busy, classic and fun Benidorm short break or holiday in Spain. 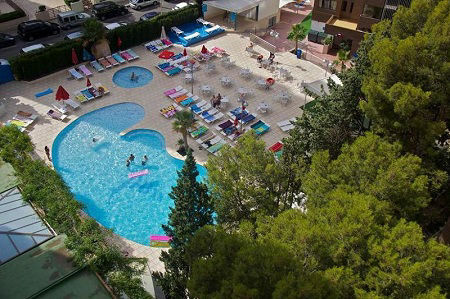 Friendly staff, busy pool scence and pool bar during the day. Good for groups of mates! Non-stop pool party resort, live guest DJ´s plus tons of fun and games for groups. Foam parties, food, and drinks included. Stag/Hen OK. 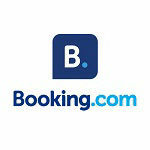 Available to book as a holiday with flight and transfers included. 100% wild and messy! Benidorm Stags and Hens! ALL INCLUSIVE Aparthotel! 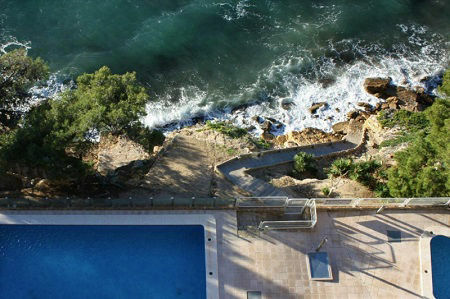 Beautifully redesigned beach apartments in La Cala for families or friends to enjoy some down-time. Beach, sea views, café bars ice cream parlours just a hop away. Benidorm 15 minutes by frequent bus. Ideal for small groups and Benidorm weekenders. 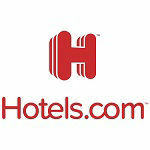 Good reviews for helpful friendly staff and service plus English Breakfasts. Refurbished (2018) pool with sunbeds plus café bar to get the party started. Great Gin & Tonic and Cocktail selections here! A taste of real Spain by the Blue Domed Church. Plonked on top of the old town, Queens Apartments by MC are in an amazing location in a small Plaza. With views across the bay. Mal Pas beach just 70m away (steps). Cosy and great for singles or couples. 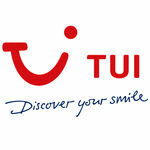 For lively beach holidays in Spain. One (sleeps 3) and Two Bedroom Apartments (sleeps up to 5). Full kitchen with oven/hob plus a kettle and fridge. Simple style for a cheap Benidorm holiday. 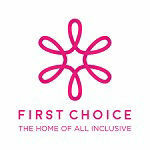 Self Catering / Half Board / ALL Inclusive options. 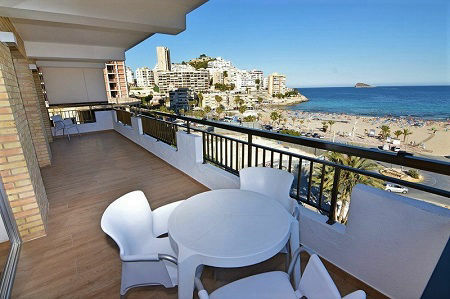 Good hoice for budget holidays in Benidorm. Choose to eat out, eat in or even go ALL INCLUSIVE. Tops for value. Not far to pubs and cafés. Superior apartments, sea views, pool, beach and sunsets! What more could you ask of a self-catering holiday in Spain other than sunset and sea views, a pool to take a dip with steps to the rocks below and a massive sandy beach a few minutes way. 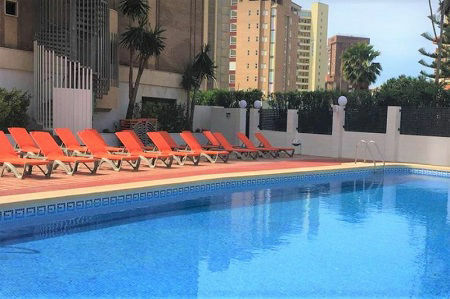 In the residential area of Benidorm old town the refurbished Ribera apartments have all you need for a cheap holiday in Benidorm. Enjoy little local café bars. Each simple apartment offers either a cosy studio, one bedroom or family apartment. On the beach and Levante waters edge. 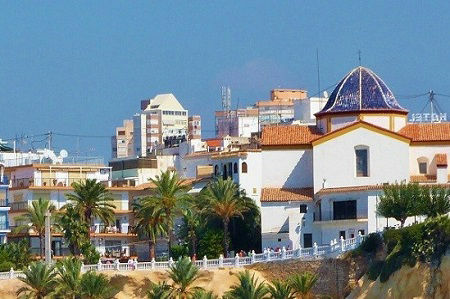 Small low-rise studios and apartments over two floors right on the beach in the old town of Benidom. A choice of one bedroom apartments, and simple compact studios (some with no views). Tons of lively café bars nearby. 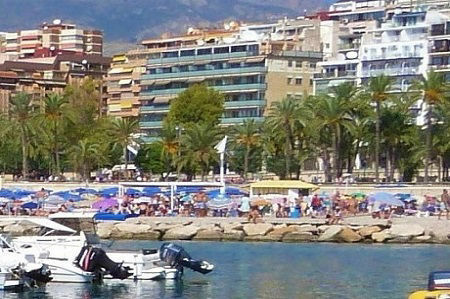 Great for cheap Costa Blanca self catering holidays for a fun and lively holiday in Benidorm. Standard or premium apartments sleeping up to 4 guests. 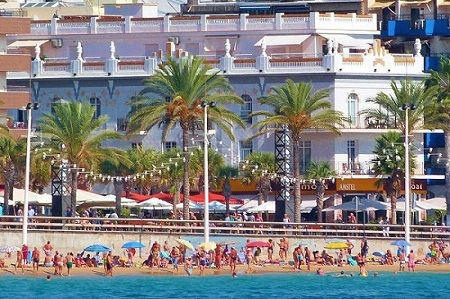 Beach is 10 minutes walk and you are surrounded by lots of bars and cheap eats! Good for groups of friends (no Stags/Hens). Popular Family friendly edge of the old town in a quiet location. 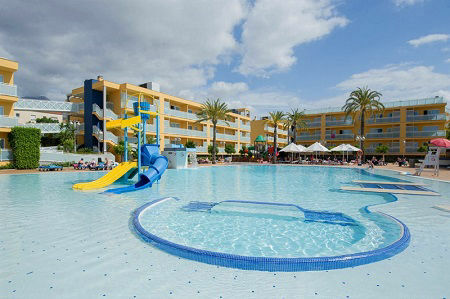 Simple bright 3 star aparthotel around a big pool is an affordable choice for families and friends. The stroll down to the old town Tapas bars and Poniente beach takes 10 minutes with shops along the way. Great value 2 star apartments 10 minutes from the beach and nightlife. Quiet area with lots of cheap bars and restaurants. One bedroom apartments sleep up to 4 guests. 24 hour reception. Great views from sunny balconies. Simple but comfy ideal for couples or friends. Affordable choice. 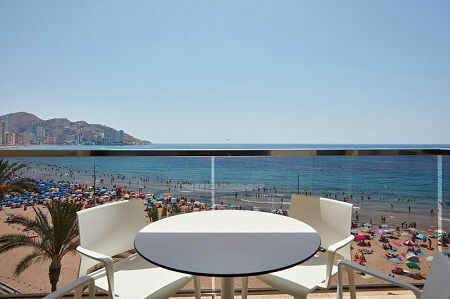 Directly opposite the beach in Cala Poniente for a quiet relaxed self-catering holiday in Benidorm. Choose from a choice of simple one bedroom apartments or studios. Very laid back. The restaurant Bahia is onsite. Super choice for a quiet beach holiday in Spain. 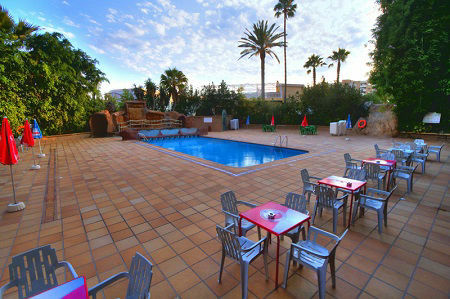 A good place for crazy weekends in Spain These apartments are what they are, simple basic cheap budget accommodation ideal for young party groups, Stags and Hens.